BS 5252 is the British Standard framework for colour co-ordination for building purposes and incorporates derived standards such as those for paints (BS 4800), vitreous enamel (BS 4900), plastics (BS 4901), sheet and tile flooring (BS 4902). BS 381C is the range for special and mixed colours, particularly for military use. Free delivery (2-3 days) to UK mainland only. This colour-fan contains representations of all the colours from BS 4800, BS 5252, BS2660, BS381C and other British Standard colours. 475+ colours, five to a leaf and 145mm by 55mm in size. 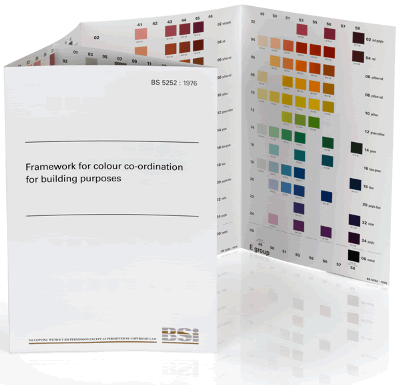 BSI specification and colour chart in a A4-size folding wallet of all BS 5252 colours. Framework for colour co-ordination for building purposes (UK). This large BS 5252 Fan from the British Standards Institute contains 234 colour patches 64mm x 62mm, three to a leaf. 297mm by 63mm. BS 5252, incorporates derived standards such as those for paints (BS 4800), vitreous enamel (BS 4900), plastics (BS 4901), sheet and tile flooring (BS 4902). The colours 00 E 53 (black) and 00 E 55 (white) are included in this fan. [Please note this does NOT include BS381C colours]. This BS 4800:2011 Fan from the British Standards Institute contains 120 colour patches 150mm x 50mm, one colour to a leaf. [Please note this does NOT include BS381C colours nor 00 E 55 (white) or 00 E 53 (black)]. 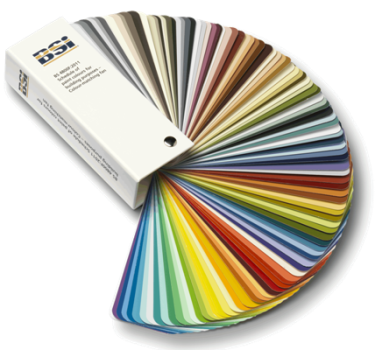 Colour references are included but no colour names are printed as there are no official names to BS 4800 colours and paint companies may refer to these colours with a variety of different names. 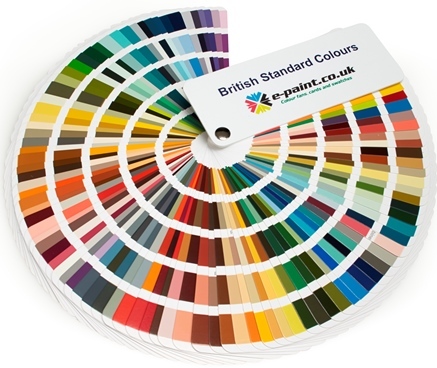 We have tried to include as many name references as possible in the BS 4800 colour chart. 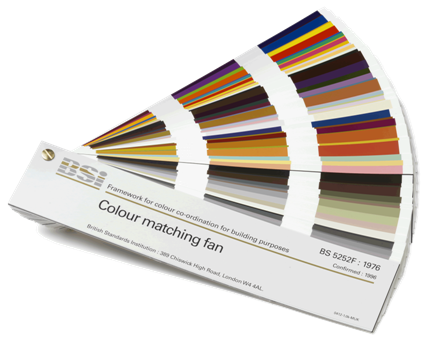 This colour fan replaces the individual box colour card matching set. Price: £29.99 per card incl. Size: 148 x 105mm - 5.83" x 4.13"
We regret that a few colour cards may not be available and are therefore not included in the list below.